Dr. Reece and team on the beach. 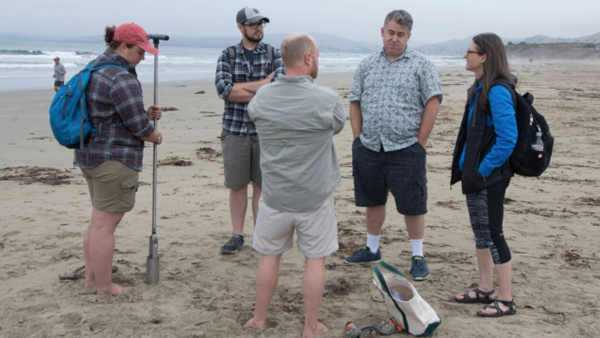 Dr. Joshua Reece (Biology) and a team of experts from Fresno State are collaborating on a project that integrates campus classes with research in Morro Bay. Morro Bay has a natural harbor, and much of the economy of the city of Morro Bay depends on that harbor. Morro Rock was artificially connected the mainland in 1936 and the creation of that connection altered the flow of sediments out of the harbor. Without periodic dredging, the mouth of the harbor would silt up and boats would no longer be able to access the bay. "Clearly, dredging is necessary for the local economy," said Joshua. "At the end of our study, we hope to be able to offer suggestions that might mitigate any negative consequences of these practices on local wildlife." The team assesses the impacts of dredging on beach biodiversity, chemistry, and sand characteristics. "We assess the impacts in several ways," Joshua said. 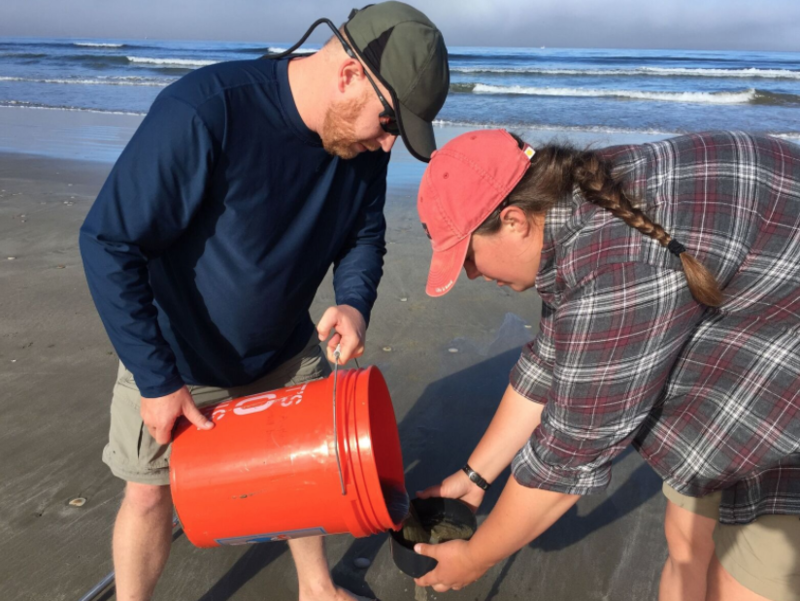 "First, we sample invertebrate diversity in the sand to see if the species that live in dredged sand are the same as the species that live in more natural areas of the beach. Second, we examine how bird diversity varies at and around beaches that have had dredged sand deposited on them. Third, we examine the sand grain size and stratigraphy. Fourth, we test for contaminants and any differences in the chemical makeup of sand on beaches with and without dredge spoil. Our sampling occurs monthly over the course of one year." The team is evaluating the impacts of this process through the use of Course-based Undergraduate Research Experiences, often abbreviated as CUREs. "Our research is supported by a grant from the CSU Council on Ocean Affairs, Science and Technology (COAST)," he said. Dr. Reece and CSU honors undergraduate Shelby Moshier collect samples. Seven classes are currently involved. Joshua teaches a BIOL 189T course on Population Biology that will assess impacts to birds and invertebrates. Dr. Kate Waselkov (Biology) is examining changes in beach vegetation with her BIOL 125 Plant Taxonomy course. Dr. Beth Weinman (Geology) is investigating changes in sand grain size in her CSM 10 First Year Experience and Hydrogeology (EES 217T) courses. Dr. Mara Brady (Geology) is examining how the sand grain layering (stratigraphy) record changes in the beach environment over time in her sedimentology (EES 102) and stratigraphy (EES 122) courses. “This interdisciplinary collaborative project is a great example of a ‘wicked problem’ that students and faculty can tackle together," said Mara. "By using this real-world problem as opposed to cookbook labs and experiments, the students will learn just as much, if not more, disciplinary knowledge, and will also gain valuable skills that will help their professional careers. They have an opportunity to experience first-hand the interdisciplinary nature of science and the value of collaboration." Finally, Dr. Eric Person (Chemistry) is testing for differences in the chemical makeup of the dredge and any potential contaminants in his CHEM 106 course. The participation of students varies by class, but generally students are taking field trips to Morro Bay and collecting samples or taking surveys, and analyzing the samples on campus. "We use this research project as a mechanism to teach the concepts in our courses," said Joshua. "We are integrating our research into our teaching because it helps students succeed by increasing the relevance of the material. It is also a lot more fun this way, both for us and for the students." At the end of the semester (on Dec. 8), the team will have a symposium in which students from different disciplines share their results on this collaborative project. "Beaches are incredibly important habitats for many different resident and migratory species," Joshua said. "We want to make sure that when we modify beaches, for example by pumping dredged sand onto the beach, we minimize negative impacts to that environment." The goal is to assess the impacts, if any, that pumping dredged sand onto the beach has on local wildlife. "Many different species of birds utilize beaches for breeding and foraging," Joshua said. "We want to know whether or not these species are affected by dredging projects, and if so, in what ways and for how long."